The objective of our beginner course is to develop basic competence in archery such that on completion of the course the beginner will be able to join an archery club, and shoot safely, at a good standard. 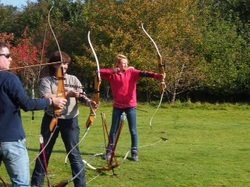 Archery is a skill based sport and new members are required to complete a beginner course before they can join the club. Returning Archers who have previously been Archery GB Members are invited to attend for an assessment to determine the best route towards joining, this may involve retaking a beginner course. PLEASE BE AWARE, ALL JUNIOR ARCHERS MUST BE ACCOMPANIED BY A RESPONSIBLE ADULT AT ALL TIMES. Beginner courses 2019. Our first beginner course is now full. Our second course starts on 2nd June. Contact us for more details. Only people who attend and successfully complete all sessions will be awarded a certificate of safe shooting enabling them to join Archery GB (the governing body) and Hellingly Archers. Contact us for an application form. All sessions must be attended in order to become a member of Hellingly Archers. The course is appropriate for complete beginners; people who haven’t shot a bow before and for people with some previous archery experience who are perhaps seeking to refresh their skills or looking for a re-introduction to archery. All necessary equipment is provided for the duration of the course. For those wishing to join the club, equipment is available to use until an archer is ready to obtain their own. Your assigned equipment is adapted where necessary and appropriate throughout the beginner course and the early stages of membership, to suit your individual strengths and needs. We will provide all of the archery equipment that you need, so please do not purchase expensive equipment at this stage. There is really no need to buy anything.